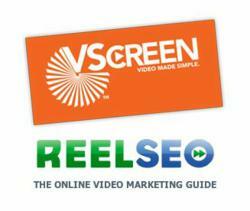 ReelSEO.com, the nation’s premier video marketing website for businesses, has partnered with VScreen in a major initiative to broaden its instructional content. VScreen will contribute weekly "How To" videos to ReelSEO.com, covering all aspects of video production...for both beginners and veterans alike. Our videos will be a bit unconventional…viewers can expect to see a blend of humor and satire in how we present the material. ReelSEO.com, the nation’s premier video marketing website, has partnered with VScreen in a major initiative to broaden its instructional content. California-based ReelSEO.com, who’s content focuses heavily on Internet video marketing…will be joining forces with VScreen, a custom video production studio specializing in business videos, to provide viewers with more hands-on technical advice on how to shoot, edit, and produce video. ReelSEO’s founder Mark Robertson noted that online video’s exploding popularity has triggered a desire by many businesses to include video as part of their marketing strategy…as well as learn how to produce their own videos in house. Robertson welcomed the VScreen partnership as a major step toward meeting that need. VScreen’s Stephen Schweickart said his Orlando-based firm will be providing a series of weekly videos covering everything from beginner’s basics to advanced content for those more experienced. Product video reviews for both hardware and software will also be include, making ReelSEO.com a one stop solution for both marketing and production advice. “Our videos will be a bit unconventional…viewers can expect to see a blend of humor and satire in how we present the material. We believe that adding a different twist will not only engage viewers more effectively…but mix a little fun into the process as well”. Viewers will be able to see what it looks like by visiting ReelSEO.com beginning Monday, May 7 when the first video of VScreen’s instructional series will appear.